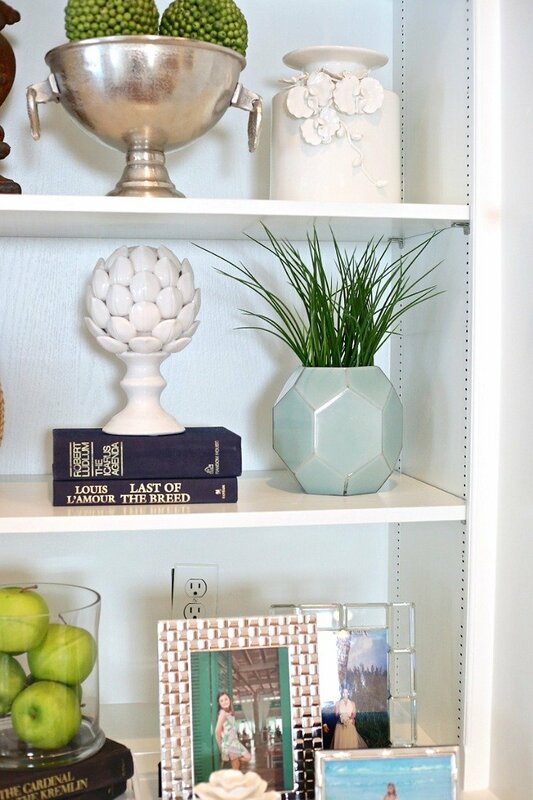 Over the years, there have been so many little decorating and accessorizing tricks that I use throughout my home that I thought I would pull them together and share them with you. These are little home styling tricks take just a second to do and include using items in ways that you may never have thought of before. 90% of faux greenery out there I would never use because it sends me back to the early 90’s when everyone was doing faux ivy on top kitchen cabinets (true story). Ugh! 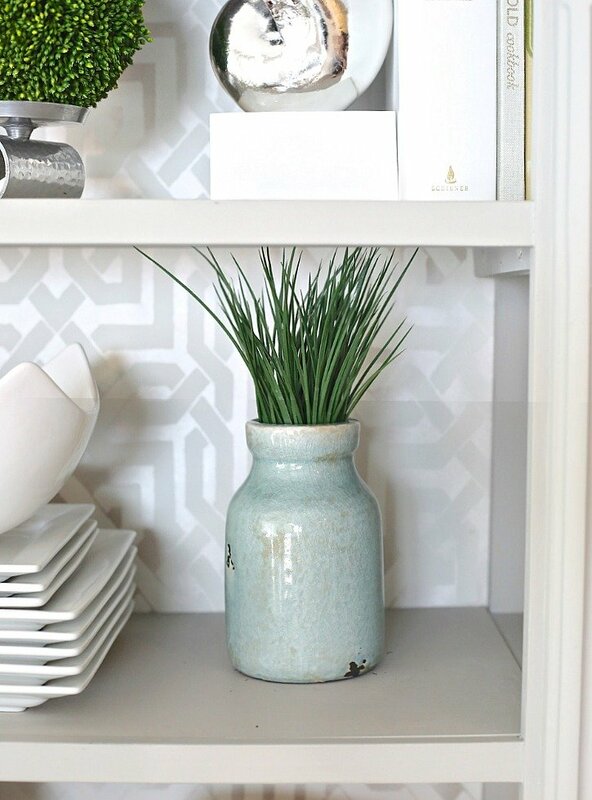 However, there is one faux greenery plant that I love to use a lot throughout my home and it’s (long) wheat grass. What I love about is that I not only get texture and height with the spiked blades of grass, I also get something organic and that fresh greenery look. I use this quick trick everywhere in containers in my bookshelves, in jugs, on side tables and on countertops. 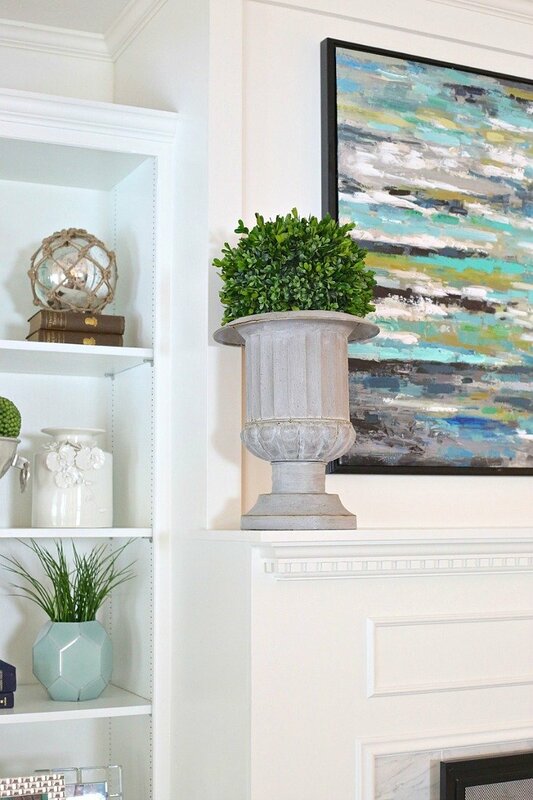 This piece above is in my living room bookshelf and you can see, it really adds that pop of texture and greenery and it takes just a couple minutes to do. 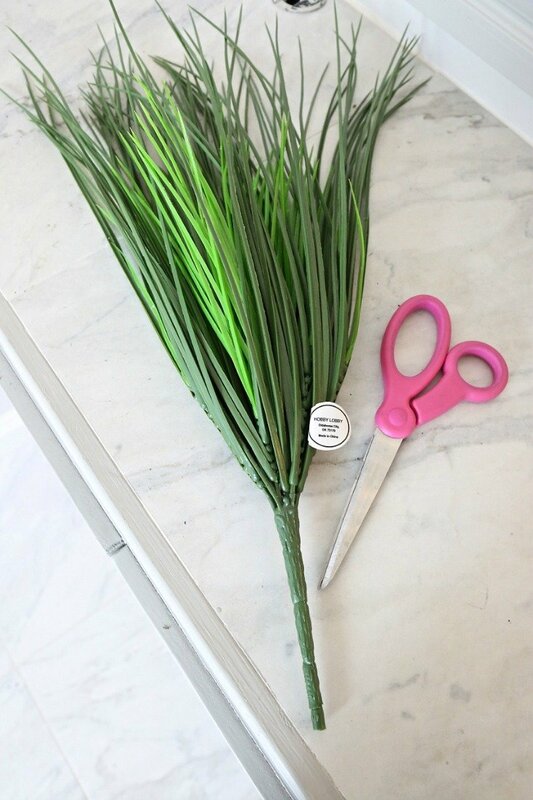 For smaller containers and vases, to cut the end of the plant, I just use scissors or a wire cutter and cut off each bundle of blades/strands at the base of the plant. You can add these spiked leaves to almost anything, even small jugs or crocks like I also did in my kitchen bookshelf. 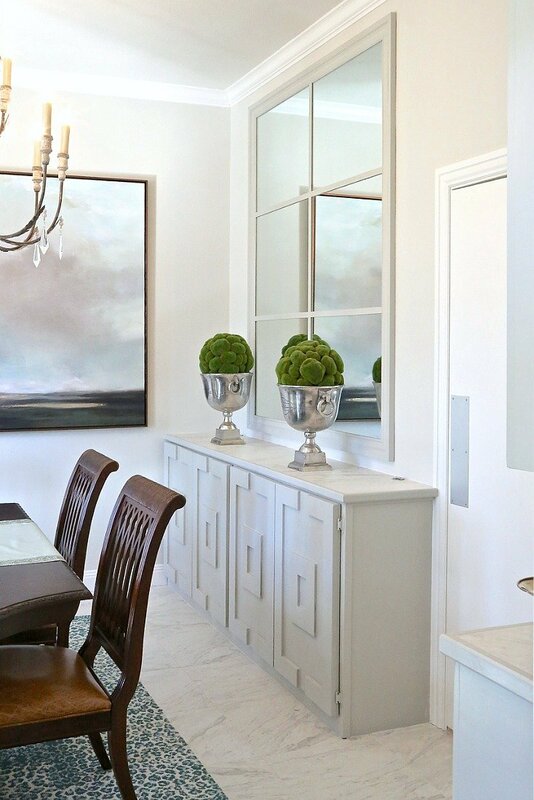 See how it adds height, texture and that organic pop of green? I get the long wheat grass in the plant stem section at Hobby Lobby (not the main floral stem area). I’m sure Michael’s and other craft stores have it. 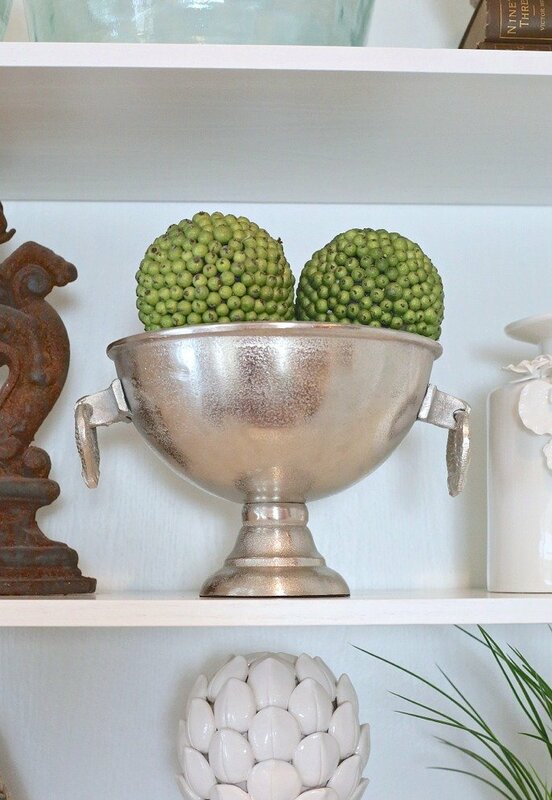 There are some really creative ways to decorate with moss, boxwood and green berry balls and they come in small and large sizes. 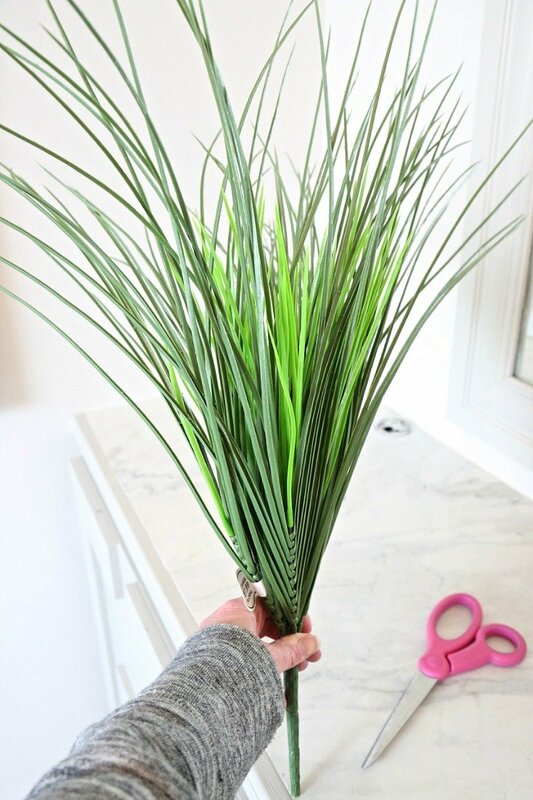 Again, this is a super quick and easy way to accessorize and get that pop of organic green without have to try and keep alive a real plant. 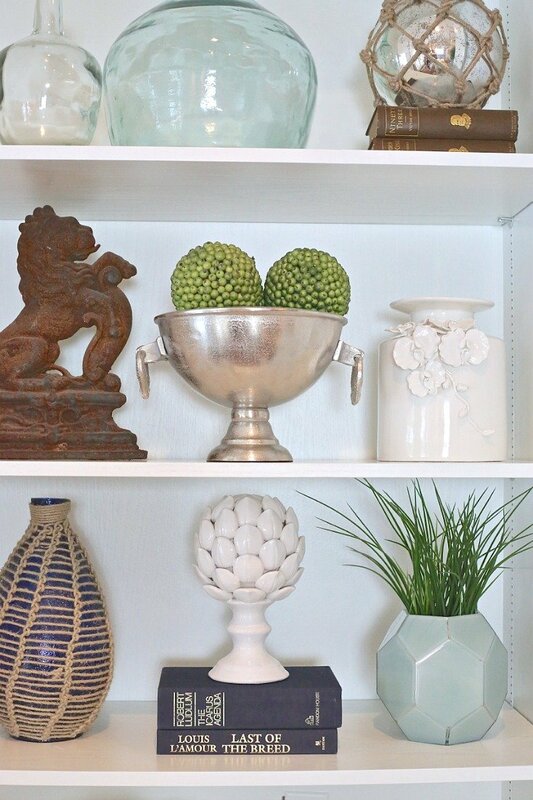 You can see how the green berry balls instantly add that color and texture in my open shelves. Also something I want to add.. You will notice in all my pictures today that I decorate my home with a lot of entertaining serving pieces. I do this because not only are they are really pretty mixed in but these pieces are not taking up room in my kitchen cabinets. I use cake stands, ice buckets, champagne buckets, wine chillers and even silver serving trays in my shelves and throughout my home out in the open. That frees up more space in my cabinets. For instance, I use this pewter ice/beverage chiller in my living room bookshelves with the dried green berry balls. 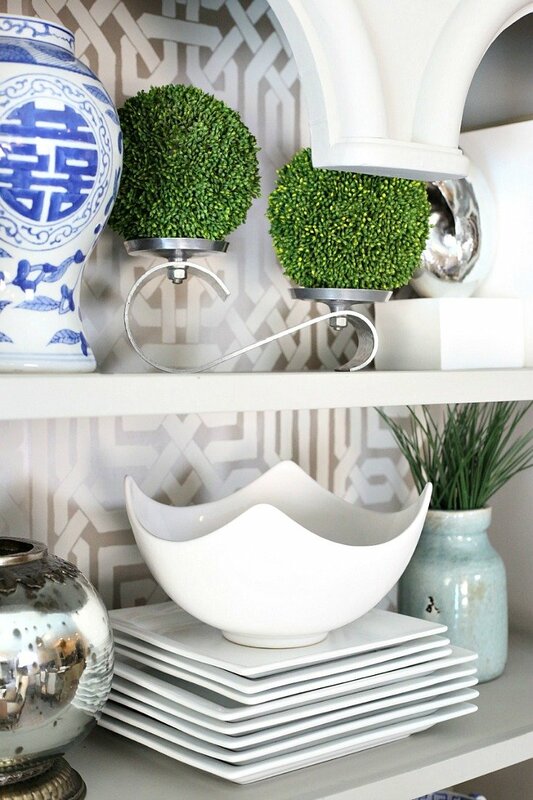 Boxwood and moss balls are another quick and easy way to instantly accessorize and add that green. They also come in small to extra large sizes and again, I use them frequently because (again) it’s fast, easy and organic. I place the extra large size boxwood and moss balls on top of urns and champagne buckets in my home. 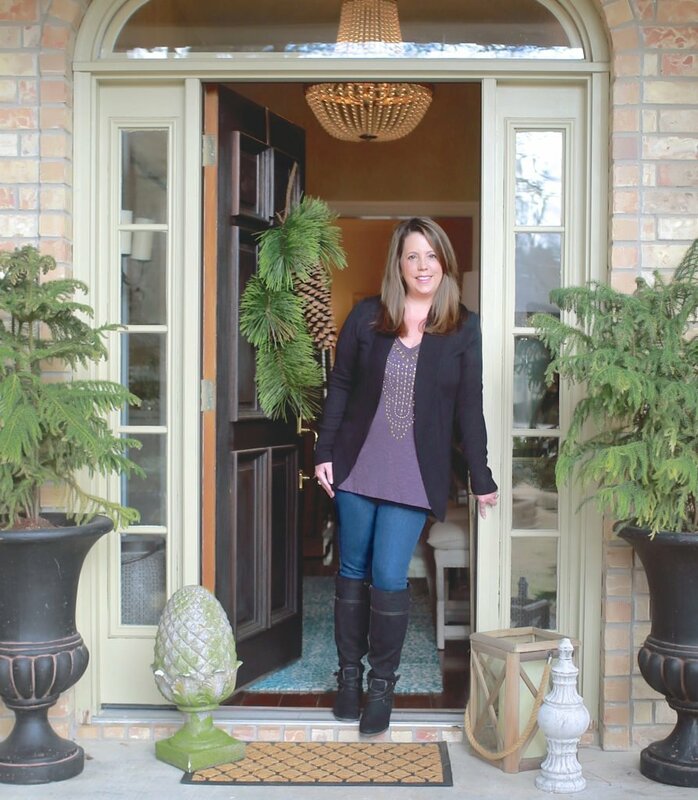 Even if you do not have any urns or champagne buckets, take a look around your home. Look at garden planters, ice/wine buckets and chillers and decorative bowls for the large moss/boxwood balls. 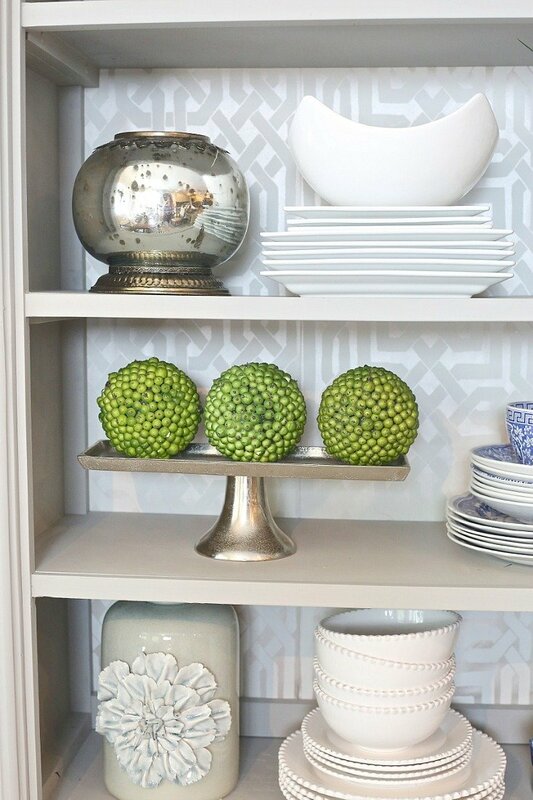 For the smaller balls, I slip them on candle holders and small sugar bowls and I layer them on books, trays and on shelves. I also slip various size moss balls into my arrangements and centerpieces to add even more texture. By the way, if you’re interested in how I do my orchid arrangements, you can find my tutorial here. Also, you can order various sized moss balls (be sure and look closely at size) on Amazon here and boxwood balls in various sizes can be found here (Affiliate Link). 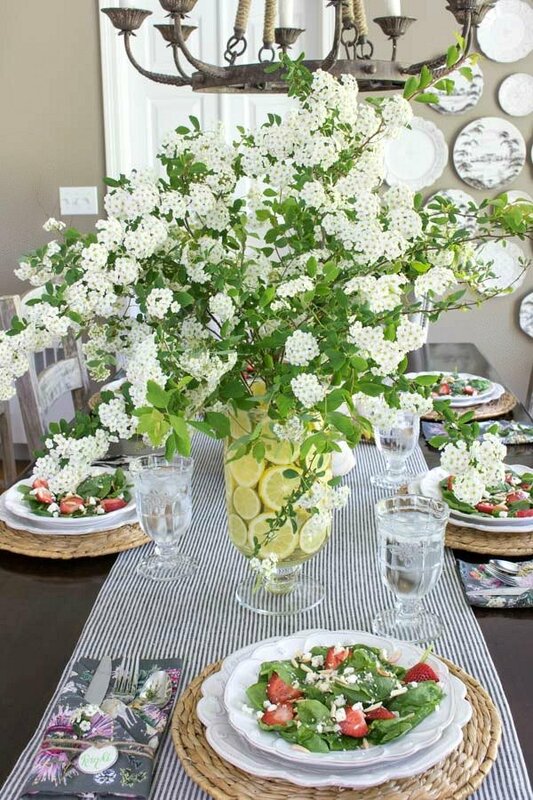 One of my favorite trick is to slip a vase into a vase for perfect fresh flower arrangements. This is the perfect way to use either an oversized vase that is too big for flowers or an antique vase that you don’t want to get wet. Better yet, a narrower vase holds the flowers tighter and it looks more arranged. 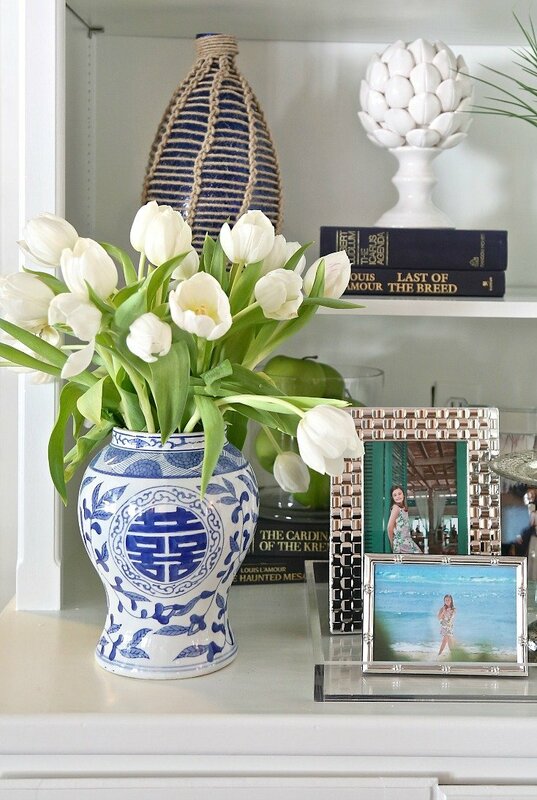 I have a very narrow tall glass vase inside of the blue and white vase that is holding the tulips together tighter in water. If I had not have done this, the arrangement would be too small for the vase and the tulips would be drooped over the side and unruly. I actually learned the vase in a vase trick from my friend Kris from Driven by Decor who added fruit slices to the outside of the interior vase. How smart is that?! 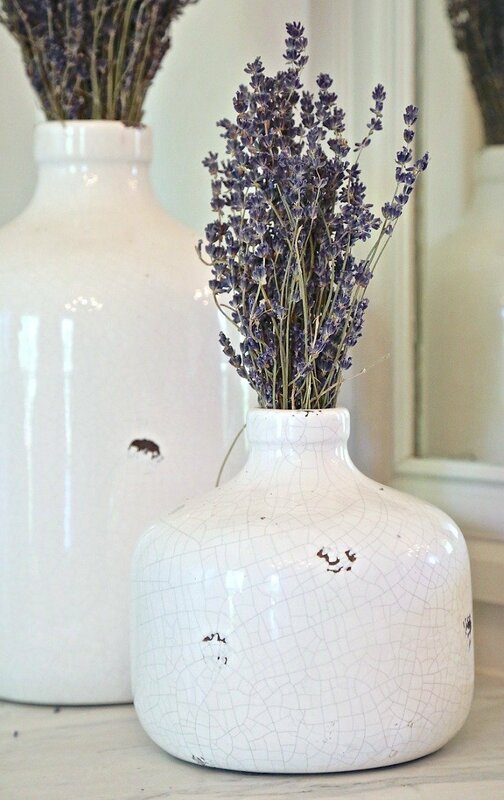 Another fast decorating trick, for various size jugs (small or large) are using dried bunches of flowers (like lavender) just slipped into the top. Even if they rest on the lip of the jug, it surprisingly works beautifully! I do this all the time with lavender, eucalyptus and for taller dried leaves in the fall, wheat looks so pretty! 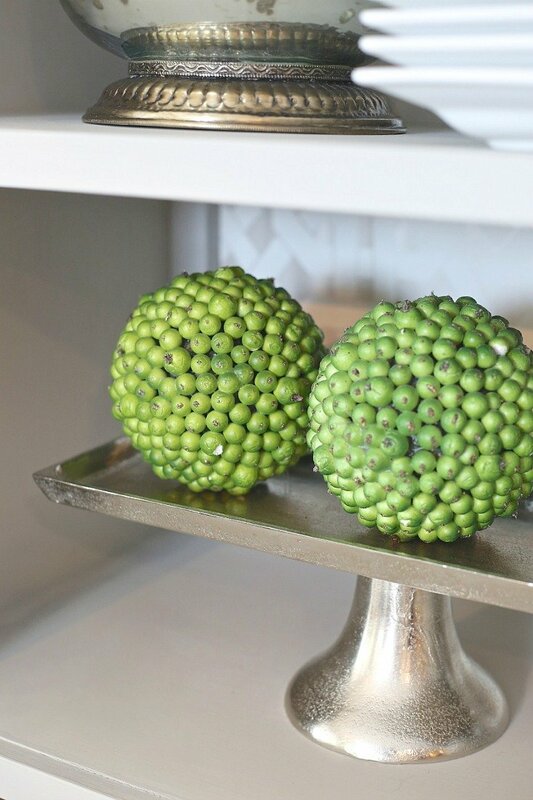 Yea, I know a few of you will cringe when I mention decorating with faux fruit but the truth is, some faux fruit can look really pretty used in certain ways. It’s also a fast and easy way to work in a pop of color. 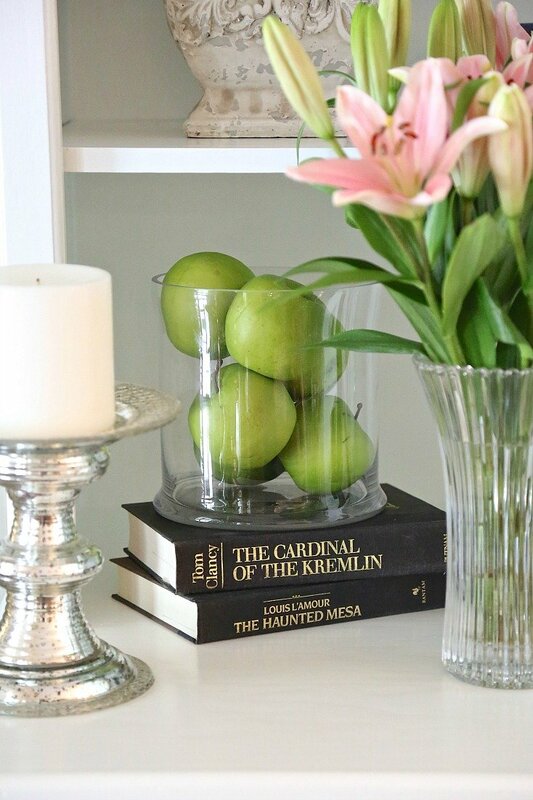 I LOVE to use faux or wood green apples in glass candle holders in my shelves to get that fun jolt of lime green. Of course, you can do any size clear glass candle holder or case. 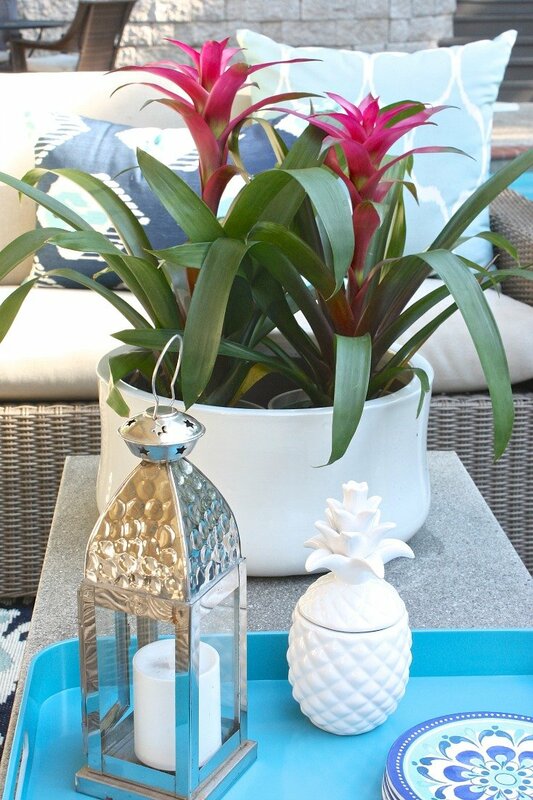 I have used faux lemons, mini pineapples and pears in similar ways throughout my home in glass bowls and candle holders and its just another fun way to add color. This spring, I worked in mini faux pears (and moss balls) into my kitchen table centerpiece, which is a metal long trough. 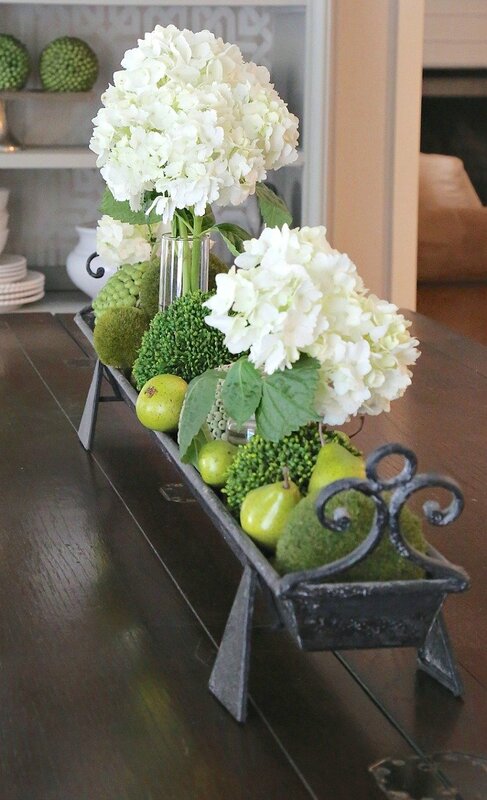 Mini pears/green apples are so pretty worked into arrangements or even in a decorative bowl. 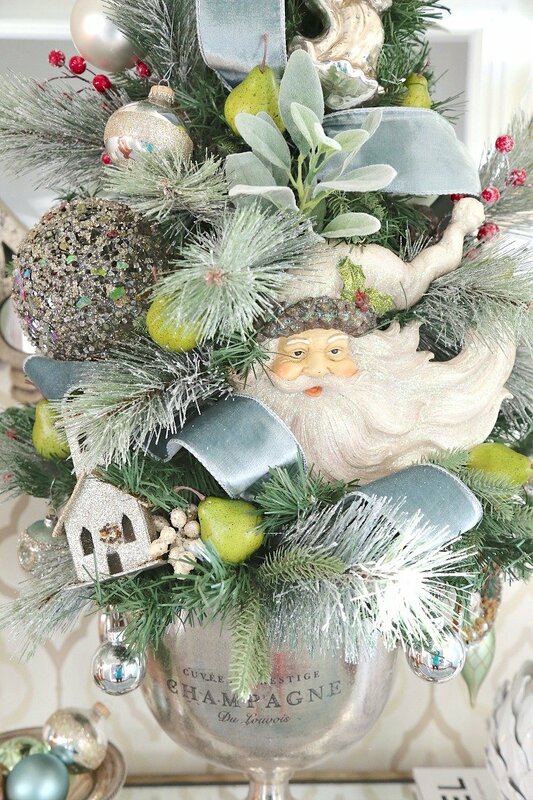 This last Christmas, I stuck floral wire into bases of mini faux pears and worked them into my entryway Christmas tree. See, faux or wood fruit is really not so bad at all! Faux vegetables are another story (except artichokes!).. 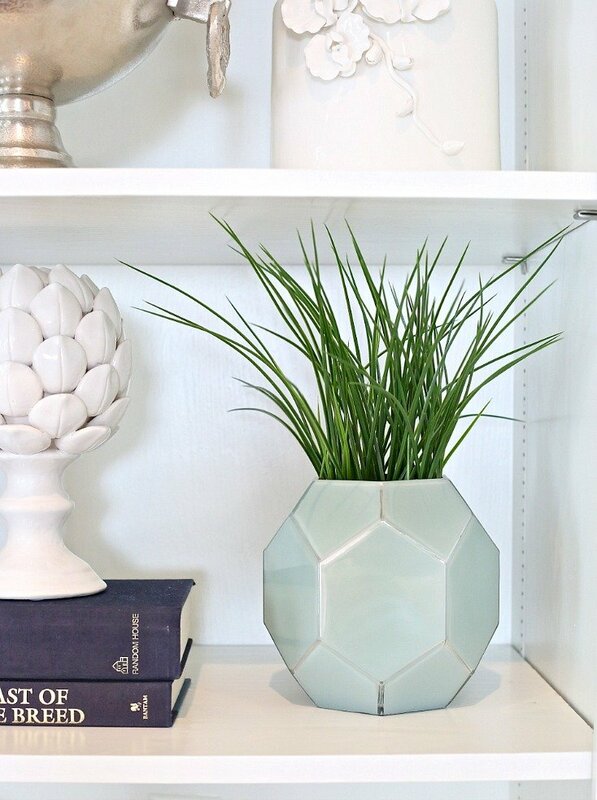 Lastly, another quick decor trick is to double or even triple up on plants (if your container has the space). In my entry way, I use a large pewter wine chiller and instead of only slipping in one plant, I slip in 2-3 as the seasons change. 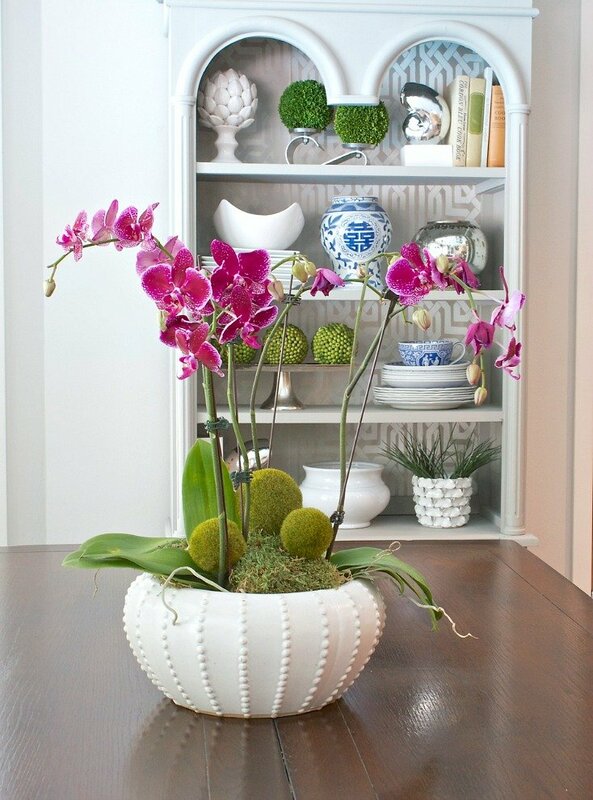 The double/triple plants really make a beautiful arrangement and plants like Bromeliads, African Violets and Orchids look amazing! Ok, well I still had more things I wanted to show you guys but I think 1179 words on this post is more than enough. I think I’ll do a part 2 in the next couple of weeks! By the way, if you’re looking for great key pieces to incorporate into your styling, especially shelving styling, I pulled together some of my favorite pieces to use along with shelving styling tips here. I would LOVE to know if you have any quick little 5 minute styling tricks that you use in your own home. Share them in the comments with us so we can all see them! Cyndy, Fantastic tips! Thank you for so many beautiful ideas…I’m off to Hobby Lobby now! LOVE these ideas. I saw moss-covered balls used as topiaries with burlap wrapped pots. I ran to the craft store and found the large moss ball, but not the smaller one, so I bought a styrofoam ball in the right size and loose moss to make my own. 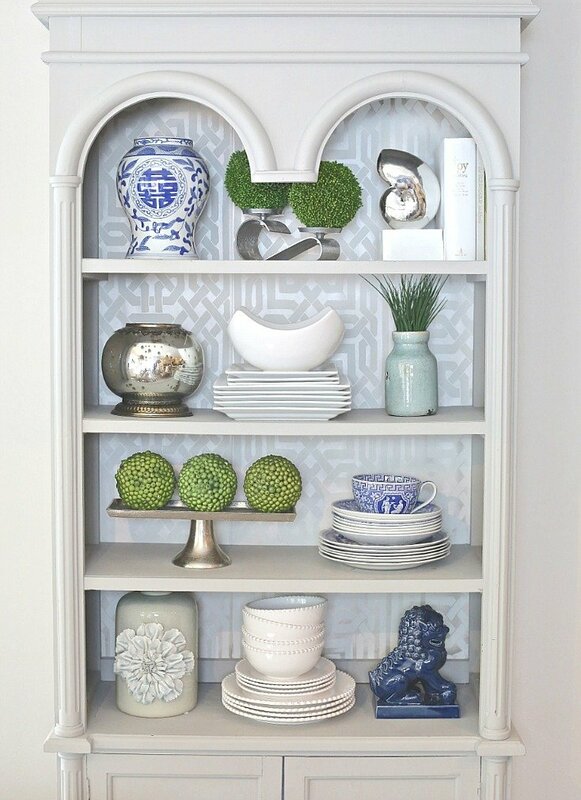 I added lime and navy accents to my grey and turquoise living room, and love using faux plants as the “lime.” Your suggestions gave me wonderful ideas for my bookcase. Thanks! 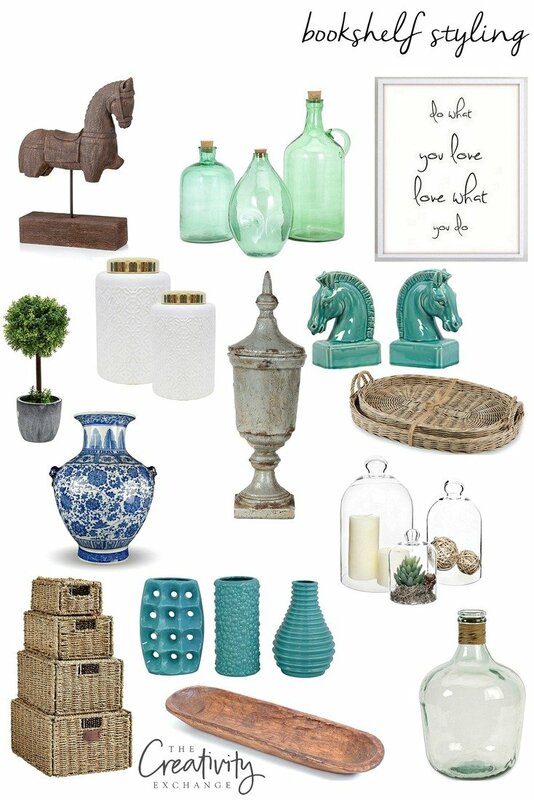 Love these pops of green. 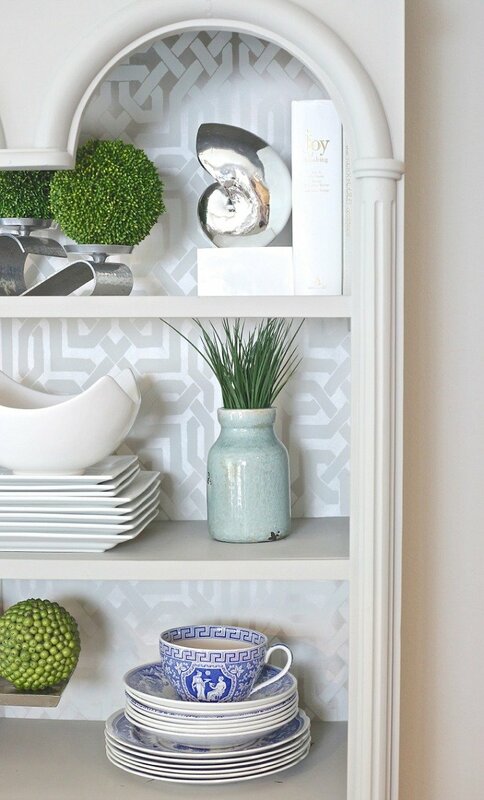 I need to incorporate some of these ideas in my house to lighten up for spring! I love all your creative ideas…so easy to do and that’s what I need…thank you so much for sharing! 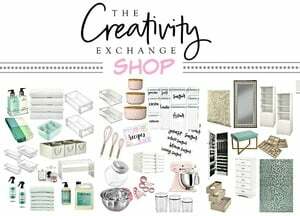 Easy, clean, idea overload…..and I Love It! Thanks for sharing, and for taking the stress out of the process! I’m glad to see you agree with me on quality faux flowers. I have some peonies that I bring out when my real ones are blooming. My allergies won’t let me bring in the real thing. Even my gardener sister in law bent to smell them. 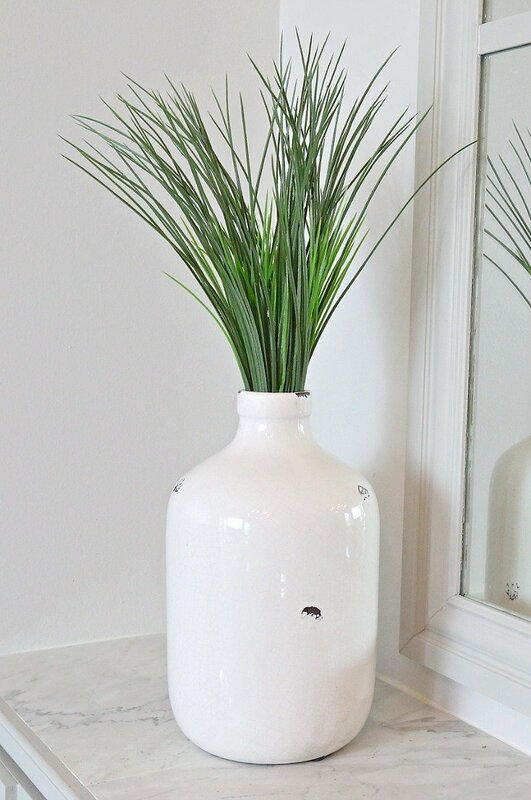 The vase ina vase is such a great idea, because I don’t like the faux stems showing. Love the pops of color. You know, I have been seeing some really amazing faux peonies myself lately and have been thinking about picking up a few. They really do look so real. I so wish I had a green thumb and could grow them! 🙁 Have a great weekend! 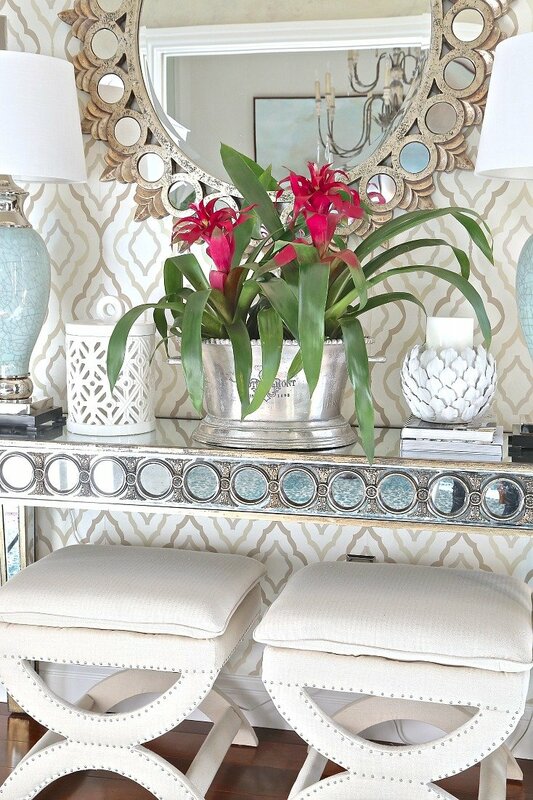 Love the vase in a vase idea. You gave me the solution to a problem I’ve been trying to solve for the passed year. Cyndy, can you give a brand/source for the wheat grass? Love, love, love all your ideas especially the metal trough! Trying to find something similar. Can you give me any idea where you got it? Thanks!! 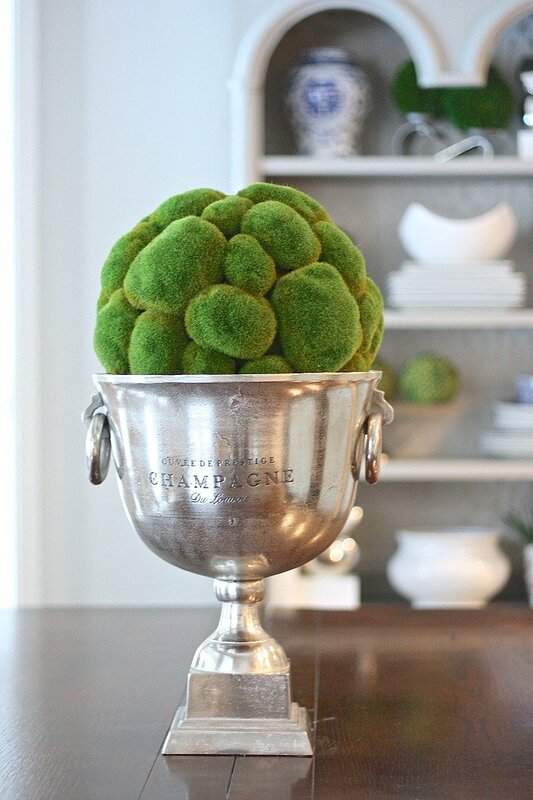 Love all your ideas, can you tell me did you make or buy the moss balls in the champagne containers on your sideboard in your dining room?